The Norton Model 18 debuted at the 1922 Paris Salon and was the dominant sports bike of the 1920s. It remained the fastest production bike on the market for many years. 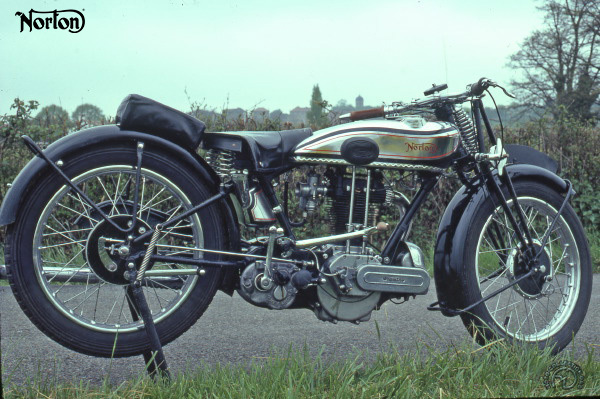 With a minimum of preparation, it gave works riders Alec Bennett, Joe Craig and Stanley Woods victory in major international events until1927, when it was replaced by the sohc Norton CS1. The other riders who distinguished themselves on the Model 18 were Italian stars Tazio Nuvolari and Achille Varzi. The Model 18 was powered by the last engine designed by the marque's founder, James Lansdowne Norton. Its engine dimensions and gearbox were the same as the famed 16H, but the valves were operated by pushrods and rockers. The prototype caused a sensation at Brooklands in 1922, when Rex Judd covered the flying kilometer at 98.4 mph. To uphold the Model 18's claim to be the fastest on the market, Norton organized a test in 1927, asking the ACU – the governing body for British motorcycle sports – to choose six engines from the production line at random. They were sealed, shipped to Brooklands and mounted in the appropriate frames. Observed officially by the ACU, the six engines were timed at over 80 mph. The Model 18 was updated each year – in 1929, it gained the saddle-tank along with a rudimentary foot-selector for the gearbox. The Model 18 was produced until 1954. The 490cc Norton Model 18 single was the most handsome machine of the 1920s, particularly in the original saddle-tank version of 1929.